Informal meetings are taking place to discuss this Plan: NGOs on the 6th March, Private Sector on Thursday 7th March and Member State (MS) on Monday and Tuesday (11 -12th March) . We welcome this important draft Plan. In it you will see that there are many good things, not least several mentions of breastfeeding (Paras 11and 36a) and 16 references to Conflicts of Interest (5 more than in the previous Drafts). This sounds a lot - but not all are watertight enough for such a tricky issue, especially when there is so much talk of partnerships. The proposal for a Global Coordinating Mechanism - which includes a "Social Movement on NCDs) - really needs some work and a specific inclusion of COI safeguards. Para 22 Actions for the Secretariat: 22 c) Policy advise and dialogue: While we welcome the inclusion of the action for WHO “to provide guidance to strengthen governance, including management of potential conflict of interest in engaging the private sector in collaborative partnerships for implementation of the action plan.” We urge that i) the scope is broadened from a focus on collaborative partnerships to include policy making and implementation ii) WHO develops decision support tools and guidance on governance and managing conflicts of interest, and iii) WHO collates and shares examples of good practice in governance. 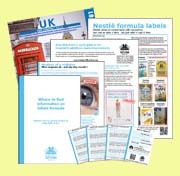 Existing text: Promote, protect and support breastfeeding, including exclusive breastfeeding for the first six months of life, continued breastfeeding until two years old and beyond and adequate andtimely complementary feeding, WCRF ADDITION: and, in this regard, strengthen the implementation of the international code of marketing of breast milk substitutes and subsequent relevant World HealthAssembly resolutions”. 4.1. Paragraph 8. This paragraph lists some of the key background documents. It would be valuable to include here the Global Strategy on Infant and Young Child Feeding (WHO 2003) in particular because it makes reference to the need to protect and promote the use of nutritious locally produced indigenous foods, which are especially valuable for lower income families without the means or facilities to make use of commercial products. Protecting breastfeeding and promoting appropriate complementary foods reduces the risk of child obesity and the NCDs linked to early malnutrition, and the GAP draft refers in passing to the GSIYCF later in the document (e.g. as part of the life course approach). Inputs received from this consultation will inform the further development of principles, policies and procedures related to WHO’s engagement with non-State actors, including nongovernmental organizations and private commercial entities. All comments submitted are subject to review by the Secretariat prior to the Secretariat posting them on the WHO website. WHO reserves the right to summarize and/or edit any submission in consultation with the submitting party. Profits and pandemics: prevention of harmful effects of tobacco, alcohol, and ultra-processed food and drink industries. "We assess the effectiveness of self-regulation, public—private partnerships, and public regulation models of interaction with these industries and conclude that unhealthy commodity industries should have no role in the formation of national or international NCD policy. Despite the common reliance on industry self-regulation and public—private partnerships, there is no evidence of their effectiveness or safety. Public regulation and market intervention are the only evidence-based mechanisms to prevent harm caused by the unhealthy commodity industries." CLICK HERE for a 13minute film by AIMi (Indonesia Breastfeeding Mothers Association) the IBFAN group in Indonesia with support from Save the Children.